Willard challenges the reader to consider the practical and practitioner-based approach to manage business differently; all of this vision and charge posted in 2002. While 10 years ago, this simple and clear outline of seven potential business benefits to sustainable development is exactly where companies, today, are needing as a 'starting point' to adopt, adjust or enhance sustainable business practices as a profit imperative. Willard introduces the potential as part of his "proposal" chapter noting a "road-map" into the future including consideration and planning that challenges existing models and structures and the more reactive "problem avoider" vs. the proactive business entrepreneur who builds business strategy including a filter on sustainability. He then builds the business case by providing the seven areas for business and profit benefit. As a foundation building benefit, Willard begins the seven benefits with "hiring talent" noting the asset as the most important corporate resource. A sustainable development image will be built as efforts attract the best talent in the market and reduce recruiting costs. The second benefit, "talent retention" builds on the first and helps to ensure the organization and it's teams are positioned to sustain strategy. Here he outlines the key to creating a culture of commitment, the high costs of turnover are outlined and the consideration leaders and managers should make about why people stay (and it is not because of pay). Sustainable development as part of this benefit, emphasizes that retention will come from the purpose beyond the profit. "Increasing employee productivity" is the third business benefit gained from sustainable practices. Here Willard makes a link between vision including core ideologies and the inspirational effect on employees, making multiple references to research and models in this linkage. Additionally, this chapter explains the productivity to innovation to bottom line impact as well as how team engagement, from this common vision and purpose, yields greater productivity. The next two benefits clearly outline the reduction of "expenses in manufacturing…commercial sites" through the multitude of options, based on the business type, for savings. Clear notation is provided about ensuring that environmental-related savings be delineated and potentially reinvested back into the organization, to guide accounting to define those requiring capital investment vs. those that may be defined as maintenance. Ensuring a payback period that is consistent with this reinvestment is key. Benefit six, "increase revenue / market share" is the exciting shareholder-driven business strategy and a sustainable development system challenges organizations to anticipate changes in societal and consumer expectations. A sustainable business will consider services over products, serve to increase mind share, market share and therefore overall profitability. Further the business is positioned to achieve organic growth, customer loyalty and a higher price per transaction. Finally, Willard provides a case-based description of the seventh benefit of "reduced risk, easier financing" with detailed illustrations of market risk, balance sheet risk, operating risk, capital cost risk, and sustainability risk. All work together to create an appealing place for investors. Willard works to dispel the complexity of calculation and objectivity in potential impact by providing worksheets, with calculations using a hypothetical company's financials and providing those in a 12 page appendix. As he notes and many before and after him have noted, sustainability initiatives will rarely gain traction or serious strategic consideration without hard metrics and clear linkages to the business bottom line, costs as well as revenues and overall operating profit. 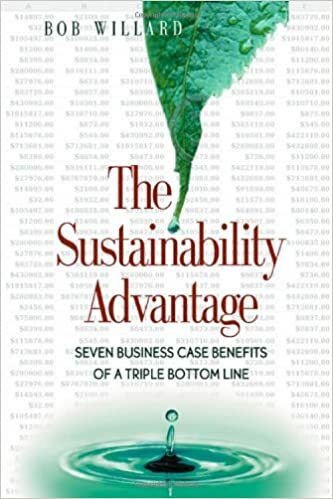 "The Sustainability Advantage" is an easy to understand and apply business book for managers and leaders in any size of business who hope to start a sustainable development strategy as part of a new business, an existing framework, or a division within a corporation. Additionally, it is a good guide for practitioners in research and consulting to help guide considerations and areas for greatest opportunity within those organizations with whom they are advising. Finally, this summary is refreshing in that it creates a solid foundation based on human capital commitment and performance; largely overlooked, un-managed and difficult to quantify areas of business, yet crucial to the ongoing and long-term sustainability of any business-focused strategy.